While some of the most popular theme parks may be in Florida and California, you do not have to head to the coastal states to get your roller coaster fix. In fact, if it's big roller coasters you crave, many of the top amusement parks in the Midwest may be a better choice. Lower ticket prices and shorter lines also make some of these theme parks more appealing. Whether you are visiting a theme park with little kids or want to ride a death-defying roller coaster, there is a theme park in the Midwest just for you. If you are a roller coaster enthusiast, you must visit Cedar Point. Known as "America's roller coast," Cedar Point, which is located on the shores of Lake Erie in Sandusky, Ohio, has 16 different roller coasters for kids and adults. Of course, it also features an array of other traditional amusement park rides and attractions for the faint of heart and those who need a break from death-defying coasters during the day. The park is open May through September and tickets cost around $40 online or $50 at the gate. 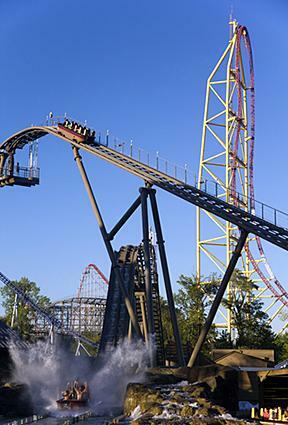 Top Thrill Dragster is one of the most popular coasters. Riders go from zero to 120 mph in around 4 seconds. The 17-second ride goes straight up and straight down for a thrilling experience. Millennium Force makes riders feel like they are going to head straight into the ground with the first 80-degree drop. 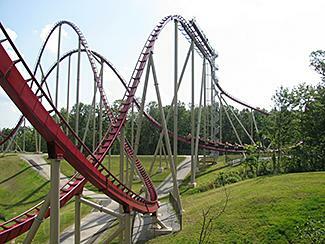 Of course, the track curves before they hit and riders get to enjoy the rest of this 93 mph coaster. Maverick has riders go through all sorts of twists and turns. If you do not get dizzy from the horseshoe roll, you'll be exhilarated as you zoom through the 400-foot long tunnel. Magnum XL-200 threatens to plunge riders into the waters of Lake Erie. Set right on the shores of the water, riders can try to catch a glimpse of Canada before heading through the tunnels and turns that make up this thrilling ride. Gatekeeper, new in the 2013 season, is a steel wing roller coaster. It features the highest inversion, turning roller coaster riders upside down and back up again, in the world and is also the longest wing roller coaster to date. Located in Muskegon, Michigan, Michigan's Adventure is the largest amusement park and water park in Michigan. When you buy tickets online, a one-day admission pass is less than $30. Admission to the water park is included in the admission price, although the water park does not operate on the same hours as the amusement park. WildWater Adventure, a water park with multiple slides, Boogie Beach and a lazy river. Known as the "largest amusement park and water park in the Midwest," Kings Island has something to offer everyone in the family. The theme park is located in Kings Island, Ohio, which is just north of Cincinnati and an hour-and-a-half from Columbus. If you live in Kentucky or Indiana, the park is close enough for a day trip or a short weekend getaway. The park is typically open from the beginning of May through Labor Day and also hosts special events for Halloween during the month of October. Tickets cost around $50 at the gate, with significant discounts offered for tickets purchased online. A short drive from both Chicago and Milwaukee sits Six Flag's Great America. The park opens in May and offers rides, attractions and multiple entertainment options to entertain guests throughout the summer. At the gate, a ticket will cost you around $60, but discounts and money-saving combination packages can be found online. 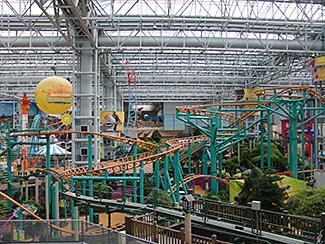 Part of the Mall of America, Nickelodeon Universe is an entirely indoor amusement park. Anyone visiting the Mall of America can access the park, but you must purchase tickets or a wristband to enjoy the rides. While the rides may be consider tame compared to a lot of outdoor amusement parks, they are still a lot of fun and kids will love that they feature some of their favorite Nickelodeon characters. East of Des Moines, Iowa, you will find Adventureland. The park first opened in 1973 with under ten rides and attractions and has since expanded to include more than 100. Around the park you will see some of its signature mascots, Bernie Bernard, Toby the Tiger and Heather and Henry, both dogs. A regular ticket is priced around $30, a great deal for a visit to a classic, family-friendly amusement park. Two of Adventureland's most popular rides and attractions are actually water-based. Gangplank & Pirate's Plummet, 60 foot water slides that launch riders nearly straight down into a pool of water. Splash Over, a thrill ride that raises riders into the air and sprays them with water, just like a human washing machine. Wisconsin Dells, Wisconsin is known for having a ton of water parks, but Mt. 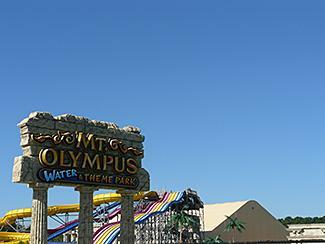 Olympus Water Park and Theme Park is one of its best. Guests may choose to purchase discounted tickets by staying at the accompanying resort or purchase all-day passes. During the summer, guests can enjoy both indoor and outdoor parks. Holiday World is a family-owned amusement park located in Santa Claus, Indiana. Tickets to this park are priced at around $30 and also offer access to the accompanying water park, Splashin' Safari. The Raven, a coaster featured on Discovery Planet's "Wild Rides"
Rides with Halloween, Thanksgiving and other holiday themes. Multiple kids' rides named for Santa's favorite reindeer. Kansas City, Missouri is home to Worlds of Fun and Oceans of Fun, an amusement park and accompanying water park. Owned by the same company as Cedar Point, Kings Island and Michigan Adventure, Worlds of Fun has a similar feel to those well-known amusement parks. Silver Dollar City is located in Branson, Missouri. The park is open from mid-March through December, although it is only open on select days during the colder months, and it offers guests a classic Branson experience. Tickets cost around $60, no matter what time of year you visit. During the summer months, the Midwest often has the same sun and high temperatures as many beach destinations. 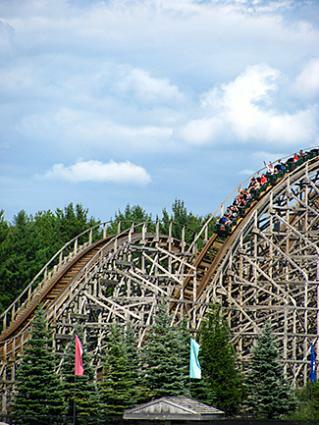 Instead of traveling to the coast, try out a Midwest amusement park. Many parks offer discounts for those who choose to spend multiple days exploring all they have to offer. For parks that have both a theme park and a water park, do the water park one day and the theme park the next and turn your trip into a mini vacation.